Suppose you have a shop worth $10K. A foreigner comes up to you and says he has $5K. He says your shop is worth investing and asks if you will issue him shares worth the same. You grab the opportunity and use the money to expand. Soon the shop is worth $20K and the foreigner sells his share to someone else for a $10K. He walks off after doubling his investment. This is how a typical FII works. Foreign Institutional Investors (FIIs) are organisations that invest huge sums of money in investment assets such as securities and debt. They include insurance companies, pension funds, hedge funds, banks, etc. which are established or incorporated outside India. 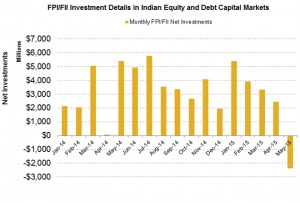 FIIs were allowed to invest in Indian securities in the aftermath of the Balance of Payment Crisis in 1991. It was hailed as a sign of India’s arrival on the global financial scene. They have now emerged as one among the most potent players in the Indian Securities market. Even the Sensex is said to move in tandem with the level of FII inflows. Indian investors keenly follow the directions taken by FIIs who adhere to thoroughly researched fundamentals. 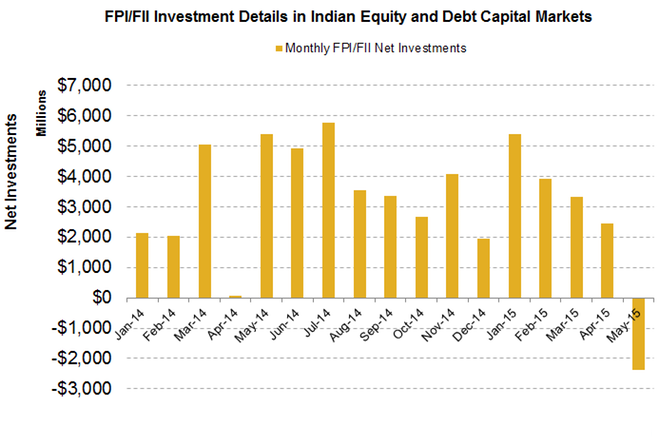 In India, FIIs are allowed to invest in primary and secondary markets via Portfolio Investment Scheme. This means they can buy shares or debentures through the stock markets. Quantitative easing of monetary controls in developed countries has increased FII inflows in recent years. The current ceiling is 24% of paid up capital of a private Indian establishment. 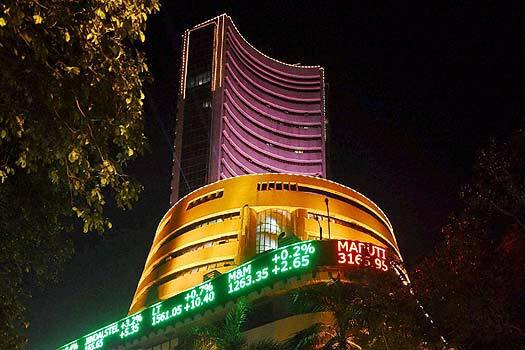 In a poll conducted by Merrill Lynch, India emerged as the favourite equity market at 43% beating China at 23%. 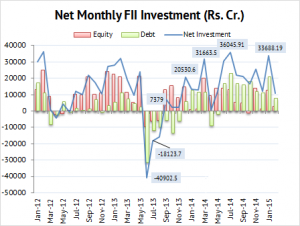 As the Indian economy is expected to recover and interest rates to be lowered, FIIs will reportedly invest a record sum this year. Already they have invested $43.5 billion in 2014-15, of which $26.3 billion in debt and the rest, in equities. Recently Moody’s Investor Service gave India a ‘Baa3’ rating and revised credit profile to ‘positive’. 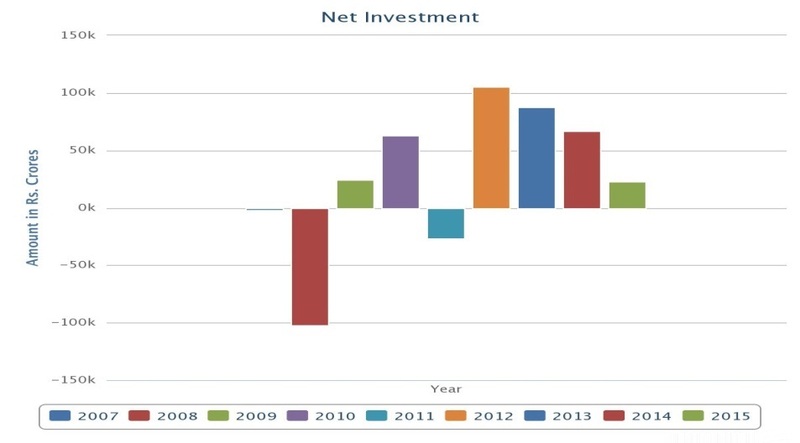 FIIs have been called “engines of growth” as they tend to accelerate the growth of markets while lowering the capital requirements of emerging economies. Famous FIIs such as Goldman Sachs, HSBC, Merrill Lynch, etc. are among the many major investors. Their entry has been linked to rise in asset prices and have supplemented savings. For example, after the NSEL scam worth nearly 1 billion US dollars, it was FIIs that in injected liquidity onto the stock exchanges. Their confidence in Indian markets stirred the domestic investor’s sentiments and the indices started to rise again. Other important effects include the introduction of new age concepts like increased market transparency and better corporate governance. Even though they have reduced their exposure in public banks due to drop in asset quality, FIIs provide necessary capital for risky long term projects that can boost the country’s economic development. But behind all this noise, are the FIIs actually contributing to the growth of our economy in a permanent way? The 2008 financial meltdown was followed by the exit of FII which hit the markets pretty hard and led to a deep slump. It has been claimed that they as a dominant player, FIIs have managed to change policies at their whim. Money is after all, power. While analysing the role of FIIs, there are two important issues to be noted – the stability of the investments and whether it causes currency appreciation. The rupee appreciating makes exports costlier and thus a widening of the Current Account Deficit. FIIs are known to cause volatility in the markets and when they ‘pull out’, the stock market crashes and wipes out the hard earned savings of small time investors. The government has eased restrictions to favour inflows, but in the process has weakened its ability to control sudden outflows. This could have wider repercussions in the future for a developing economy like India. While the Greek crisis will not directly affect India, there is concern that if the crisis spreads to other European countries like Spain and Ireland, FIIs could book profits and exit quickly. This would cause India to lose its growth momentum. Also one must remember that one of the causes of the crisis was the Greek government’s dependence on external factors to drive its economic growth. If the government wants to promote growth, it would be better to promote FDIs which invest in physical assets and thereby promote actual growth instead of just pumping money in. FDIs are usually used in setting up or expansion of manufacturing units and other such endeavours. They are a major source of on-debt financial resource for developing domestic industries. 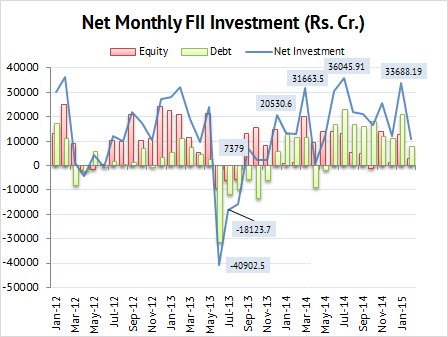 On the other hand, FIIs are not linked to increase in domestic spending. FIIs have definitely contributed to the steady stream of bull runs seen by the leading stock exchanges. But they must dealt with cautiously they are, by inherent nature, volatile and market driven. A proper regulatory mechanism is the need of the hour. India must depend on domestic drivers of economy or FDIs rather than FIIs, if it is to succeed in the long run.